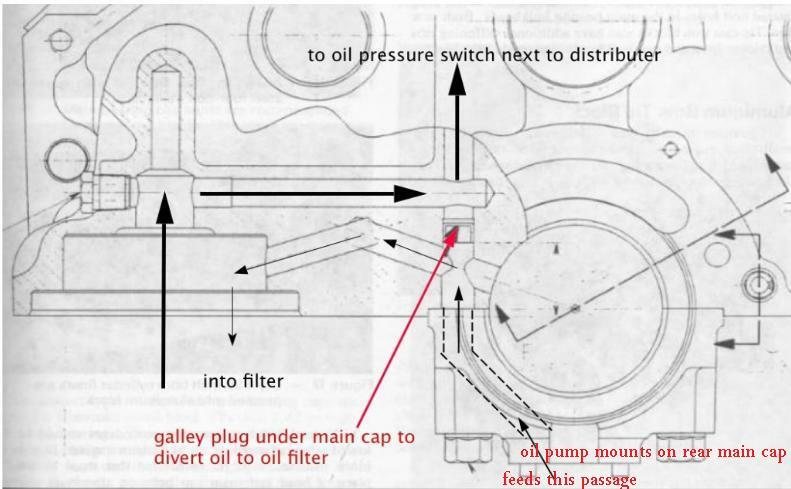 Discussion in 'Oil and Lube Systems' started by Richard Tice, Mar 29, 2019. I see that many people advise drilling .030 holes in the front oil gallery plugs. On this site, Grumpy advises drilling only the passenger side. I drilled both of mine with a 1/16" bit since it was the smallest I could find. I am having a problem with oil coming up to the rockers. 1976 MK IV BBC engine with Lunati HR cam and retro fit street performance lifters (#72331-16), Harland Sharp rockers. 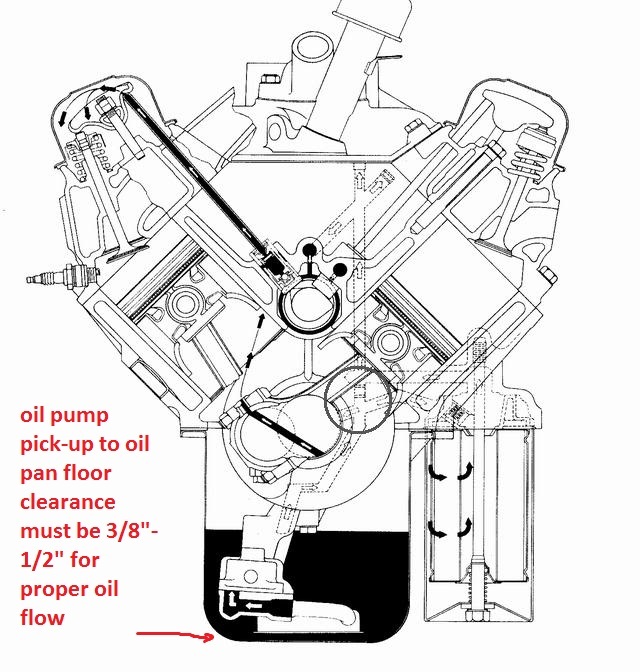 It will take 1-1/2 minutes for oil to show up at the rear rockers, then another minute or so for some others show oil, but the #1 exhaust takes 6 minutes to get oil. Does anyone know if the larger holes in my oil gallery plugs could be the cause of this delay? Should I replace them with the proper size hole plugs? Or replace them with solid plugs? those oil spray holes drilled in the front oil gallery, passages are not your main issue. on most engines this MUST be checked carefully, but most people fail to do so. and certainly having two over size holes drilled in the gallery plugs is not ideal. you really need to check that oil pan to oil pump pick-up clearance. you likely need to swap to a new oil filter , fill the new oil filter before its installed with oil and repeat, (try WIX or PUREALATOR) and if the issue does not improve you likely have an oil plug missing or incorrectly installed some place. 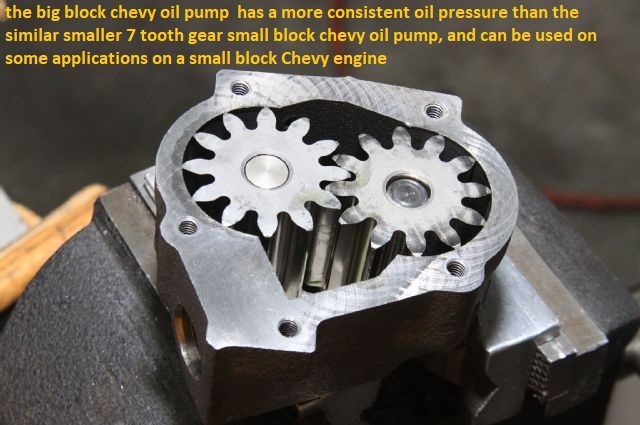 even at idle or about 700-750 rpm, thats several gallons a minute. as its not pressurized, once its flowing thru the oil passages, pressure is a measure of the resistance to flow through the clearances in the bearings and clearances. If oil fails to exit the push rods its obviously either exiting else ware or not able to flow into the push rods from the lifters and lifter gallery. Thanks for the information, that's very helpful. My pickup is just a tad under 3/8" from the bottom of the oil pan. Maybe I can coax a little more depth from the pan without removing it completely. Will another 1/8" make a difference? Your 1/16" drill bit measures .0625". The hole you were supposed to drill measures .030". 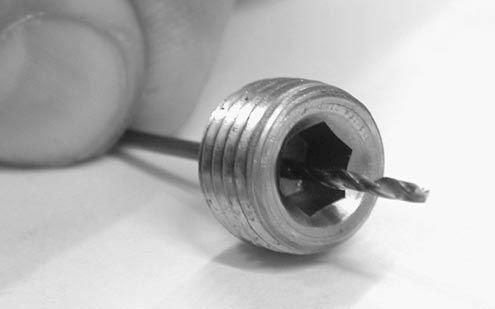 The hole you drilled is NOT twice as big as the .030" - it's 4 TIMES BIGGER in AREA. Remember PI x R SQUARED??? Double that because you drilled 2 of them. You are leaking an additional 7 times the oil you need to oil the chain and bleed air. 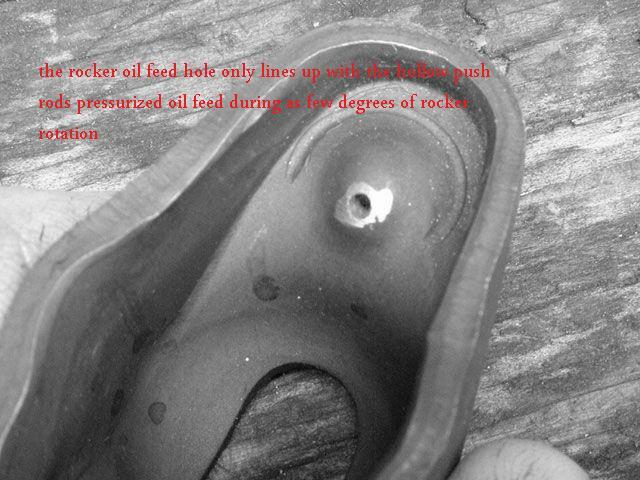 This is NOT the sole cause of your delayed oil to the rockers, but if I were you, replace those plugs with solids - no holes. The timing set gets plenty of oil as designed. to make sure the clearance is maintained when its re-installed. Reading through some of your extensive info on lifters, I'm also wondering if maybe my pre-load is too much. 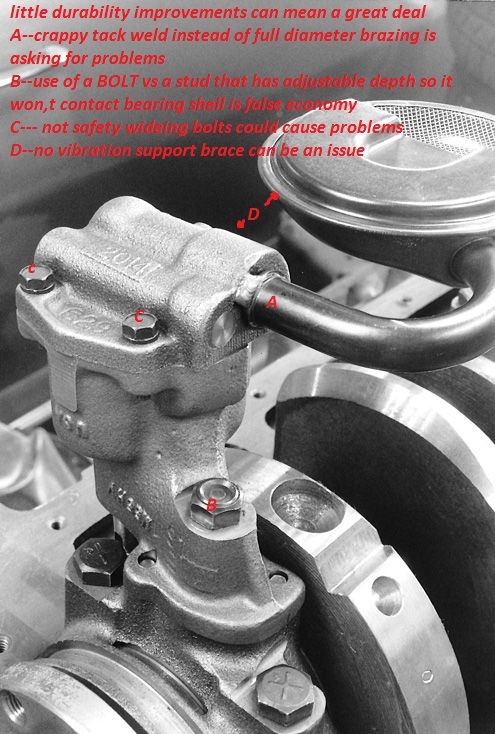 For a cast iron block and aluminum heads (Edelbrock Performer) Lunati recommends a pre-load of .030-,035" or about 5/8 turn on a 7/16" stud. I've done this and then added a little more because of the valve train noise, but I see you recommend less (1/4 to 1/2 turn after 0 lash). That would only be about .012-.025 on a 7/16" stud. I've been doing this cold, and you recommend adjusting while running. I'm going to try that next. This has given a narrow sweep on the valve stem nearly centered, but was nowhere near the push rod length that the pro-form checker suggested. Could that have an effect on oil delay to the rockers? Again, the oil does get there, it just takes a long time. 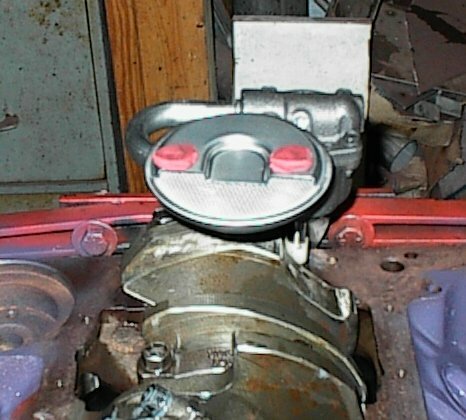 and keep in mind the rocker oil feed hole and push rod feed holes only line up for oil flow during a few degrees of engine rotation. I tried your method of backing off the rocker poly lock while idling, hearing the clicking and adding 1/4 turn. The rockers got quieter, but starting it up the next day, I still had to wait for 6 minutes for the #1 intake (that's the only rocker I can see through the valve cover oil fill hole) rocker to start showing oil. BTW, these are Harland Sharp roller rockers and there is a recess around the pushrod cup oil hole that allows oil flow at any angle. Could the lifters be at fault? perhaps I'm the only one here that seems to see the rather obvious route? or no hole at all. and you've eliminated one potential issue. 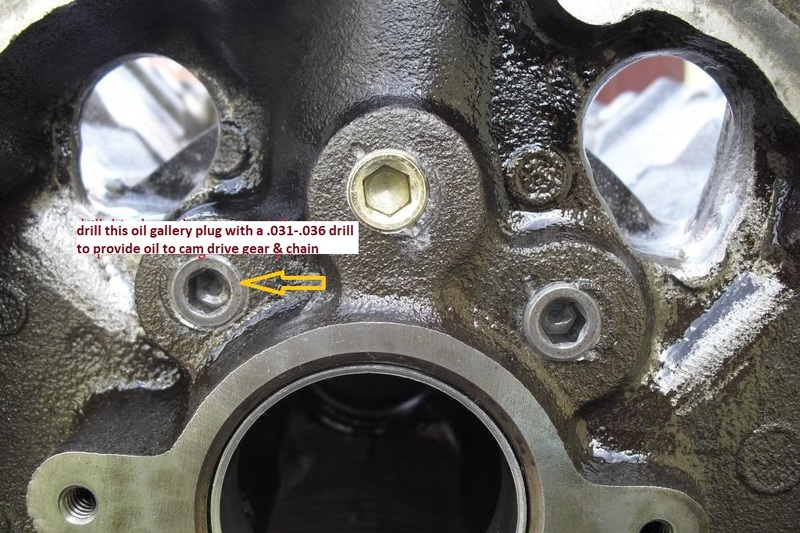 The Supply of modern Hydraulic lifters is real Shoddy bad for Flat Tappet and Roller cams. Just Crower and Isky have been reliable. Try putting 3/4 - 7/8 turn lifter preload on. I set them with the engine off today. GM called for 3/4- 1 full turn lifter preload in vintage service manuals. I went 7/8 turn preload on my Olds 425 V8. 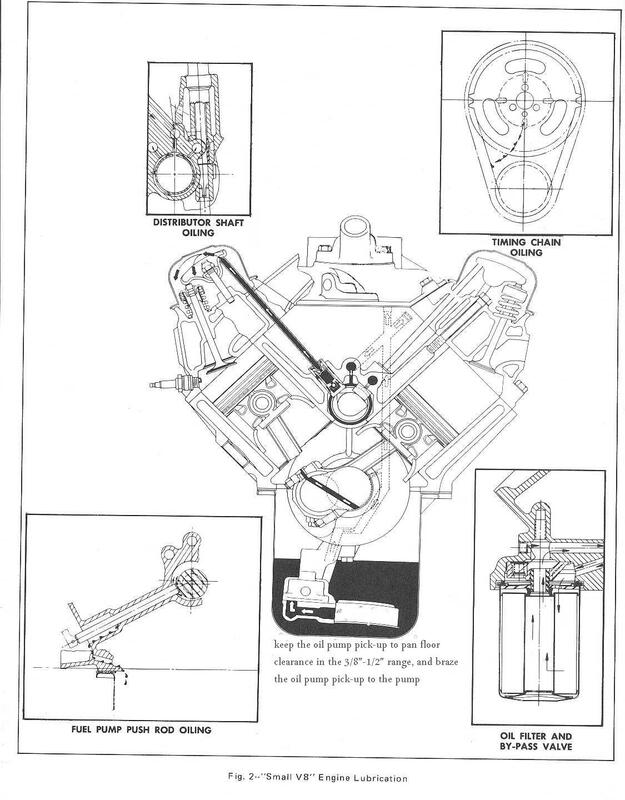 No valve float or lifter pump up at 6000-7000 rpm. It has original GM Johnson made lifters. I used to go just 1/8 turn preload. It does not work no longer with modern lifters. 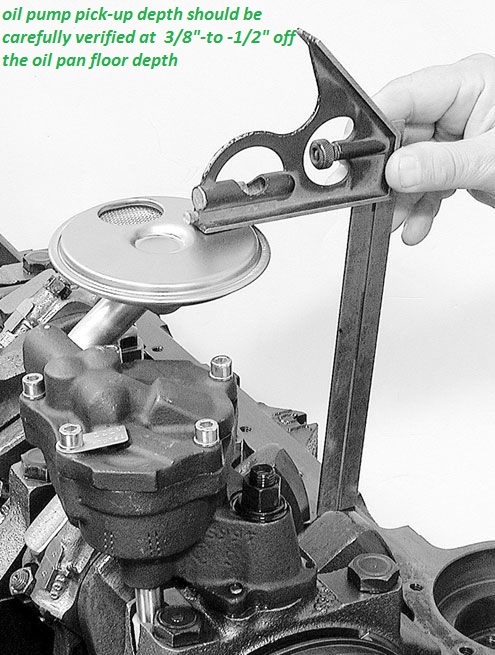 Want Revs a Solid Flat Tappet or Solid Roller Cam is best. All top end oiling issues eliminated. China lifters not used also all made in The USA. Offbrand rockers are bad too. Change to solid plugs, as Grumpy said, to eliminate the possibility of that being your problem. I had this same problem, and in my case, it was the lifters! No name white box lifters bought from Skip White - Guaranteed Made in the USA - he claims. Actually made offshore - Mexico, China, India & Turkey. As long as the company is headquartered in the US, they can get away with saying that. We have contacted the three cam companies we deal with, Crane, Lunati, and Howards, and all highly approve of this lifter. In the past we marketed these lifters under the former name, "Eaton" They are the exact same lifter. We purchase our Delphi lifters in bulk trays of 122 each, as all engine builders do. We use them in all of our engines running a hyd. 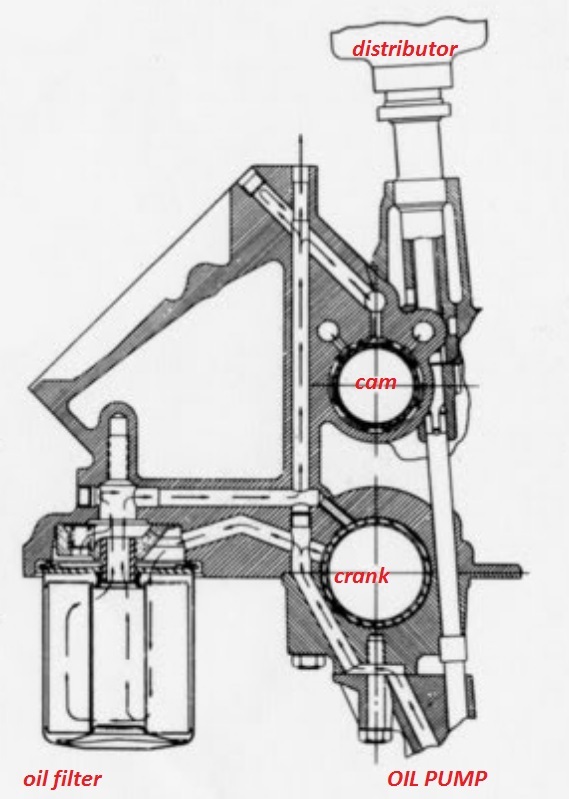 flat tappet cam. You will receive a complete set of 16 in an unmarked well protected package. The cost difference is well worth the difference, but rest assured these are genuine Delphi lifters. We can provide proof for those that are concerned. They are genuine Delphi tappets, made in the USA. The lifters I bought did not pump oil to the rockers at idle. And they destroyed my new camshaft. Even if you buy from a known good USA company, there are unscrupulous people who buy both sets, put the junk offshore lifters back in the name-brand box, and get their money back. Then the next guy buys that box of lifters and gets screwed. SOME OF US HAVE BEEN THROUGH THIS BEFORE. LEARN FROM OUR MISTAKES! I have the front of the engine torn down, hope to have the timing cover and cam sprocket off tonight. 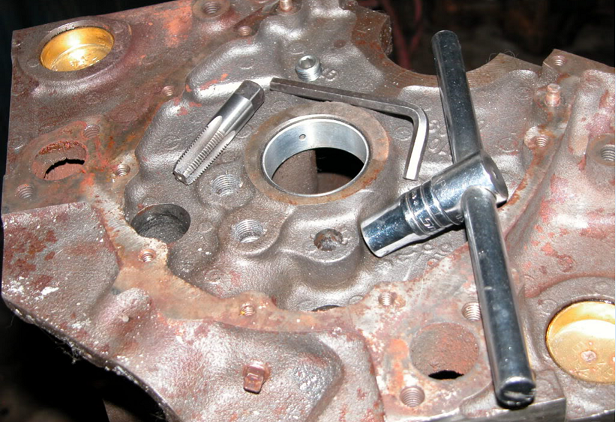 Then, I will replace both of my drilled-out lifter gallery plugs with solids. I'm hoping this is the cause of the delayed oil-to-rockers issue. If it results in no change, I'll have to address the lifters. Thanks for all the help, I'll post back when it's running again. once the current over sized holes in the gallery plugs are eliminated, as a oil flow leakage point. and thats certainly far more (two 1/16" holes) than, required or ideal. 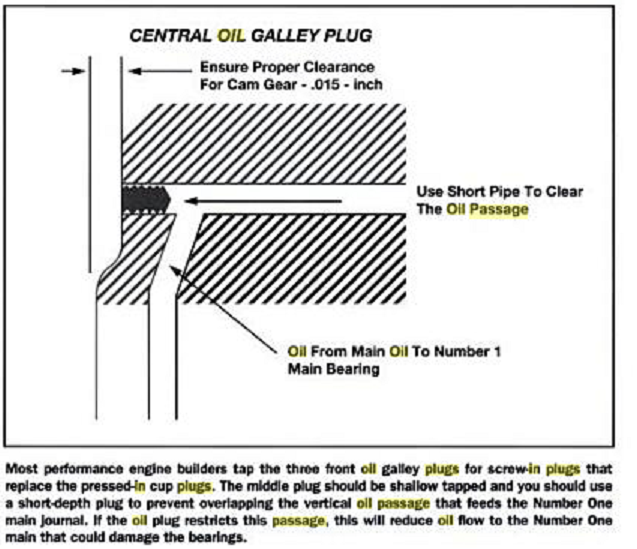 that .032--.039 hole in the pass side oil passage plug will be Just fine ! Got it back together last night, pulled the driver's side valve cover. 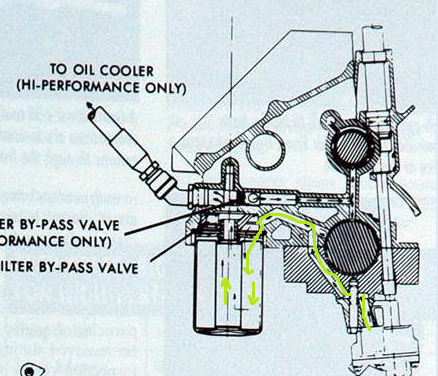 The first rocker to get oil was #3 (intake I think) at 90 seconds, then randomly, one at a time, all the others. Last one was #1 intake at 3 minutes. So, changing to solid plugs cut the total wait from 6 minutes to 3. I think any further improvements are going to require a lifter change. Buy Crower or Iskenderien Lifters. low oil pressure, in the oil passages, that builds more slowly. I haven't kept an eye on the gauge during that first few minutes, I'll do that next time I start it up. and then carefully observing HOW it is or is not currently functioning. and potential reasons for that observed difference. and measuring tools like ,dial calipers, but careful observation is critical.